Hayley Bochner, born and raised in New Jersey, started dancing at the age of five. She studied Ballet, Pointe, Lyrical, Jazz, as well as Tap. A few years later, she found her love for Contemporary, Hip Hop, Popping and Breaking, of which she is very passionate. Hayley started training in street styles like Breaking, Popping, Locking, House, Waacking, New Jack Swing and Vogue. Upon graduating high school, she moved to New York City to pursue her passion for dance, where she was able to gain an understanding of both the Hip Hop culture and the dance industry. Training at various studios in Manhattan, Hayley continues to grow and excel in her craft. Hayley appeared on season 8 of “So You Think You Can Dance” as part of the top 50 dancers. She is represented by Clear Talent Group and has had the opportunity to work with artists such as Meghan Trainor, Pharrell Williams, Chris Brown, Nikki Minaj, Psy Oppa, Silénto, Spencer Ludwig, as well as touring the country with Zara Larsson on Cher Lloyd’s “I Wish Tour.” Hayley was a featured dancer on "Glee," "America’s Got Talent," "Saturday Night Live," "The Today Show," "Late Night With Jimmy Fallon," "Live with Kelly and Michael," "The Nickelodeon HALO Awards," "The Last OG," "Showtime at the Apollo" and has appeared on Telemundo and The CW. Hayley had the honor of performing at the famous Madison Square Garden for Z100’s Jingle Ball concert with Meghan Trainor. Currently, she has been performing and traveling with “iLuminate” as one of their dance captains, and has performed for Target, Google, YouTube, Verizon Wireless, Xbox, Nike, the NFL and Nokia. 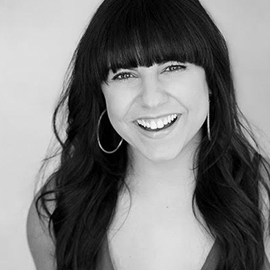 Hayley has also had the privilege of working with such choreographers as Napoleon Dumo, Fatima Robinson, Charm LaDonna, Luam, Brooke Lipton, Brian Friedman, Tessandra Chavez, Rhapsody James, Danielle Polanco, Adrian Wiltshire and Brooke Wendle. Recently, Hayley has been choreographing for several projects and showcases around NYC. She has also been traveling around the country, sharing her knowledge of dance and the industry with the next generation at studios, conventions and competitions around the country. Dance has truly given Hayley a form of expression. She wants to be able to inspire others to fall in love with the art as well as spread the culture of hip hop around the world.